Instead of going on a regular shopping spree, students get to see how fun it can be to go on a “writer’s work-shopping spree”! 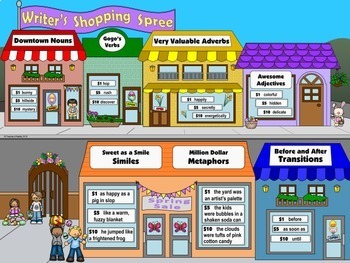 This activity invites students to “shop” for words in each of seven “stores,” with each store selling a different type of word or phrase (i.e., nouns, verbs, adjectives, adverbs, similes, metaphors, and transitions). Students are then challenged to use as many of the words as they can to write a cohesive narrative, keeping in mind that words with a higher “price tag” will be more challenging to include. Once they have finished their story, students can add up the prices of all of the words that they managed to include and find out the total “value” of their story. Finally, students are challenged to see if they can revise their story and add any other colorful words or phrases. I have found that this exercise is not only a fun way to help get students’ creative juices flowing, but it also helps to solidify their understanding of the different parts of speech and literary phrases. For some reason, students find it thrilling to add up their “receipts” as they go, and it’s great to see their enthusiasm when they blurt out something like, “Ooh—I just thought of how I can use another transition!” [Note: Students do not need to have mastered their parts of speech in order to do this activity. Seeing the samples in each “store” helps them to get the feel for the different parts of speech, without using any grammar terminology]. 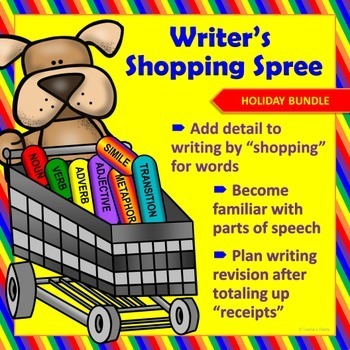 The shopping analogy helps motivate students to evaluate and revise their own writing, rather than rushing to state that they are done as soon as they’ve completed the bare minimum. It is also a fun way to reinforce the fact that successful writers use plenty of colorful words and phrases to enhance their writing. (Once the students have added plenty of color to their writing through the use of detail, they can also literally color in the illustrations on the student handout pages to decorate their story for display on a bulletin board). The students love to read their classmates’ stories to see how different they all are, even though everyone started with the same beginning. Note: This bundled product is 50% off the price of buying the items individually! 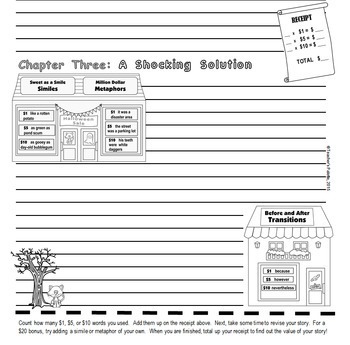 3)	Nine additional store posters (also in color) with blank word/price tags, in case you would like to create a writer’s shopping spree of your own, with the words that you are covering in class. (These can be used over and over, with different words written in each time).